it's a little chilly in the house today. 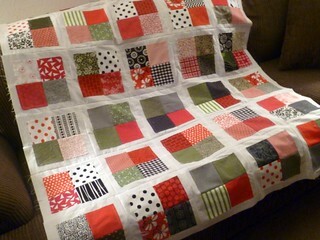 It's supposed to be cold all week, so it sounds like the perfect time to finish my Christmas quilt from, er, 2011. I used a ps i quilt tutorial, synchronized squares. It's been sitting there, in my cupboard, waiting patiently. I've decided to tie this one. I figure it's only going to be used two months of the year, so no need to spend tons of time on it. Plus I tied a quilt the other day, my first one, and I actually enjoyed it! Here are two more of the test blocks I did for QM 100 Blocks v.8. This one is called Celtic Cross, and it's by Monique Dillard. This one used a layer of tulle over some of the fabrics. It's by Barbara Cline. be sure to check out the links I've shared, there are lots of giveaways on the blog tour today!